The Game is set in England and Ireland at the time of Elizabeth I and in particular during the Irish rebellion. Katherine Fitzgerald is a young Irish noblewoman sent to a French convent after her bethrothed died. It was supposed to be a short and temporary stay, but years passed without Katherine receiving any news nor money from her family. When her best friend at the convent is called back home in England to get married, Katherine convinces her to take her along. But their ship is attacked by a pirate who takes Katherine prisoner. He wants to make her his mistress but she refuses. A head-strong and stubborn girl, she wants to marry a nobleman and have children and doesn’t change her mind even when she’s told that’s never going to happen. Katherine’s father, once a rich and powerful nobleman, has been declared a traitor by the Queen and his properties confiscated. The plot is further complicated by the Irish rebellion. The crown is beginning to regret its treatment of Fitzgerlad as the new leader of the rebels, FitzMaurice, is a fiercer and more dangerous enemy. Liam decides to help Katherine’s father to get back his title and riches but has to be careful in its actions as he’s playing a very dangerous game that could lead him to the scaffold.. I don’t wanna give too much away but there are lots of intrigues, plots and machinations in this book that make the story interesting and never dull. But while I enjoyed the plot, I really disliked the heroine, and she’s the reason why my rating is so low. We are constantly told throughout the book that she is a clever, fiery woman but she’s really just a spoilt, whining child that throws a tantrum whenever things don’t go her way. She just screams and storms off without ever giving people the chance to explain their reasons and actions, and she’s also very self-centered. She puts Liam through so much crap that I can’t really see why he bothers with her. Overall, The Game is a nice story, weakened by the irritating main female character. Dark Fires is the sequel to Sweet Savage Love. Unfortunately I didn’t know that when I first started it, but it soon became obvious because of the frequent references to the first book. The story can be easily followed and understood even if you haven’t read the prequel so I kept reading it but it’s obviously recommended that you read Sweet Savage Love first. As I didn’t enjoy this book though, I’m not sure I will. At the beginning of Dark Fires, we find Ginny and Steve in Mexico at the time of the Revolution. 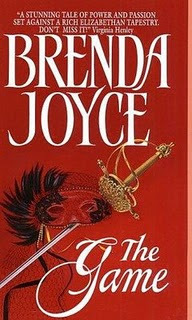 Pretty soon, though, the couple separates and ends up spending most of the novel apart, which is unusual for a historical romance novel. The book is divided into two parts: the first focuses on Ginny and her life with her second husband who gets her addicted to laudanum to better control her and make her do his bidding, while the second focuses on Steve and his temporary loss of memory which leads him to work for, and become the lover of, a woman without any scruples. The two stories don’t really have that much in common, apart from the characters of course and I felt like I was reading two different books instead than just the one. And because I didn’t really like the second part (too overdone), I would have been happier if the end of part one had been the end of the book too. But what I really didn’t like about the book was the characters. Steve is simply a jerk. He’s selfish, arrogant and just does whatever he wants without caring one bit about the consequences and who he hurts in the process. He doesn’t do bad things for a good purpose, but simply because he wants and can. It’s hard to believe that someone like that could fall in love and he’s not a hero I can relate to, let alone like. Ginny’s ok but she seems to always be getting raped/hit/abused/used.. after a while, it gets kinda repetitive. She is also supposed to be a free spirit and a fighter, but when told her marriage to Steve is null and void she just accepts it instead than trying to meet him and work things out. But then Steve has pretty much the same reaction to the annulment. And when they meet and talk, they are just incredibly mean to each other. Really, the whole thing would have been easily resolved and a lot of pain spared if they just set down and talked civilly instead than being too stubborn to admit they still have feelings for each other, but then I guess that wouldn’t have made a good story and the book would have been a lot shorter.. 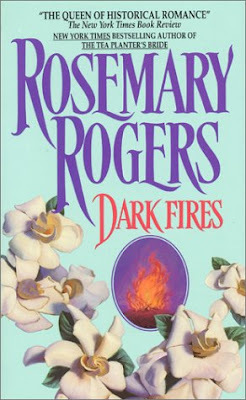 The plot has lots of twists and turns and, although I didn’t like it, the main characters make Dark Fires a somewhat unusual historical romance. 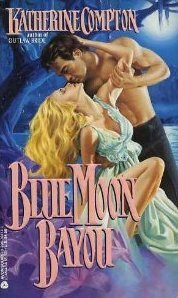 Blue Moon Bayou is set in Louisiana just before the American Civil War. Adelaide (Delia) Abernathy is a beautiful but spoilt young lady who enjoys to shock the good society of the town she lives in. She thinks she can do whatever she wants without paying the consequences because her grandmother Agatha is extremely rich and basically owns the town. But the old lady has had enough and tells Delia that if she doesn’t get married and settles down within six months she won’t inherit a penny. As part of their pact, the future bridegroom has to be approved by Agatha. And so she hires Cord Kibedeaux, a dark Cajun she’s sure her grandmother would never accept in the family, to pretend to be her fiancé. At first Cord refuses but then accepts because being with Delia will give him the opportunity to mingle in high society and find out who framed him and sent him to jail years ago. Blue Moon Bayou feels more like a Disney movie than a historical romance to me: there is the beautiful rich girl who falls in love with a poor man, the outcast and poor boy who turns out not to be so poor after all and ends up with the beautiful rich girl, the villain who tries to harm him, an old lady who lives in the swamp and dabbles in magic who helps the hero and heroine and a happy ever after. If Dark Fires is too complicated, Blue Moon Bayou is too simple and predictable. A nice story, just don’t expect too much..
Have you read these books? If so, what did you think of them?